In the light of the tremendous improvements which have occurred in equipment and the enormous amount of instructional material now available, breaking 90 remains a significant and difficult hurdle for many golfers. In fact, National Golf Foundation research suggests that only 22% of golfers regularly achieve this on a full length course, and that the average score is 97 for men and 114 for women. These sobering statistics prove that golf is hard, and that real excellence can only be achieved through dedicated practice. But it’s also true that far more than 22% of players are capable of scoring in the 80s if they would only apply some simple game management principles. When it comes to breaking 90, just thinking about the numbers for a moment will encourage you to develop the sound strategy you need. First consider that a score of 90 is 18 over par for a typical par 72 course, that’s a generous allowance of one over (or bogey) for each hole. Or to put in another way, if you never take more than a 5 on a hole, it's mathematically impossible to shoot more than 90. And keeping a 6 off your card is much more to do with carefully avoiding the real disaster holes, the double bogeys and worse, than achieving a technically correct swing. Golf is a game of “how many”, not “how”, and even a brief look at some of today’s top pros in action will confirm this view. Throughout the game’s history, the best players have also used a bewildering variety of swings. Even the true greats such as Hogan, Nicklaus and Woods didn’t become greats of the game by pursuing a theoretical ideal of perfection but by working constantly to make their own swings the best they could be. By contrast, far too many high and mid-handicap players struggle because they repeatedly fall into the trap of taking a run of poor shots or bad rounds, which even the best golfers endure from time to time, as a signal to abandon their current method and go back to the drawing board. But that is not the right mindset, any more than a bad day at the office necessarily means it’s time for you to find a new career. It’s usually far more productive to develop consistency by working with your existing swing, while using good game management to build your confidence. Apart from the obvious numerical damage to your card, blow-up holes of double bogey and worse can, if you let them, irreparably spoil a whole round through the damage they do to your confidence. It’s all too easy to mentally “throw in the towel” after one of these holes. 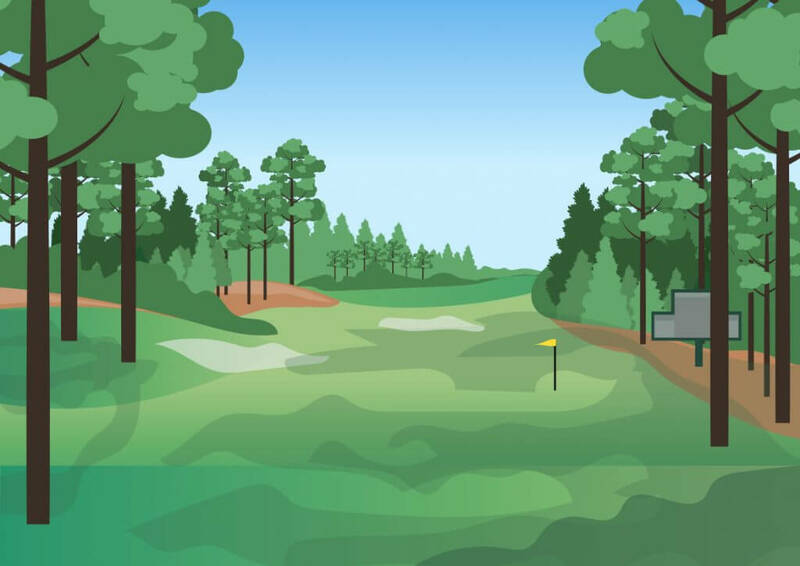 But if you head to the next tee with the attitude that it doesn’t matter where you hit it because your round is already ruined anyway, you can quickly see one disaster turn into a run of two or three, after which your chances of breaking 90 really are gone, at least for that day. Contrast this with the attitude of the pros. Sixes, sevens, and even the dreaded “snowman” eights, are not unheard of on the PGA Tour, but what’s impressive is how good the pros are at putting these disasters behind them, and treating the next hole as the new start that it is. Perhaps the knowledge that every extra shot taken means fewer dollars in the bank makes it easier for them, or maybe it was this kind of mindset that made them pros in the first place. Either way, it’s certain that the determination to play every shot to the best of your ability is one of the keys to breaking 90 or, for that matter, 80 or 70. Since good scoring and confidence come so much more easily when you are driving well, you need to try and bring this attitude to every tee. Good driving doesn’t necessarily mean consistently knocking it 250 yards straight down the middle – though who doesn’t love that feeling! It does mean avoiding penalties and as far as possible finishing on the short grass. Nothing will more surely ruin your score on a hole than going out of bounds or into water off the tee, and nothing is better guaranteed to sap morale and increase pressure on yourself than being forced to tee off again “playing three”. So don’t be embarrassed to take the safe option. If possible, lay up short of any water you’re not sure you can carry. Aim for the safe side of the fairway, away from any out of bounds or marked hazards and the worst of the trouble. The percentages almost always favor being on the fairway, even if this means a longer second shot. But however carefully you plan your tee shot, there will inevitably be times when you end up in trouble; and a cool, calculating, mind-set is then the key to rescuing the situation. On par 4 or par 5 holes, if your drive has ended up just in the light rough, and is not lying too badly, you may be able to play your second shot as you had originally planned. But if you’re lying in sand, thick rough or tight behind trees or bushes, you may have no option but to play out sideways. In these circumstances there’s usually little to be gained by trying to gain extra distance. Taking a low numbered iron and trying to curve the ball round an obstacle might work, and it’s a great feeling if it does, but the odds are against you. Instead of going for broke, hit a hybrid out of the rough. 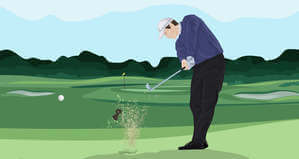 But if there is any doubt, the smartest play is to take a wedge and make sure you get back on the fairway in one shot. A careful assessment of the situation is also important if you have missed the green on a par 3. If your ball is sitting up well on the fringe or apron of the green, or even in a shallow bunker, and you have a safe line in, there may be no reason not to play towards the pin as you would with an approach putt. But if you can’t get close without a risky shot, it’s usually wiser to play to the fat of the green and take two putts for a four rather than go for a heroic save which may easily turn into a double bogey five or worse. The fact is that many par 4 holes are better played as par 5s by the 90s shooter because it is difficult, if not impossible, for them to reach and hold the green in two; and this means two typical shots, not those perfect strikes which the golfing Gods occasionally grant. Even if you’re playing from a prime fairway lie, trying to hit and hold a green which is perhaps 180–200 or more yards away is asking a great deal of yourself. 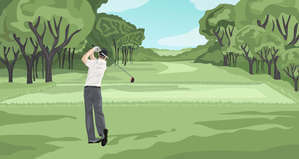 You will have to hit a fairway wood, hybrid or long iron, all of which are notoriously difficult for the average player to get the ball airborne with. It’s not that it’s impossible, but the margin for error is much less than when playing a more lofted club. 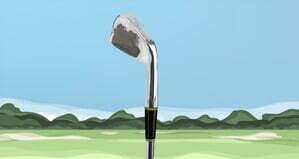 And if you are trying to hit a long club as far as you possibly can, especially under pressure, the potential for a truly disastrous topped or chunked shot is greatly increased. 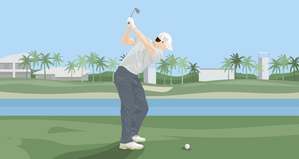 So you will normally do better to play the hole as a par 5, take a more lofted club, and play short of the green to allow yourself a relatively simple approach. By the same logic, trying to hit the green from the tee on a long par 3 can be very risky. If the layout of the hole permits, there’s no shame in playing short of the green with the aim of taking no worse than a 4. But whether it’s your second shot or your third, your final approach to the green needs to be carefully targeted. By all means aim at the pin if it is invitingly placed in the center of a broad, deep green. But far more often it will be close to the fringe and guarded by sand or water. In these circumstances the percentage shot is almost always to aim for the center of the green and rely on two putts for your par or bogey. Play conservatively in this way and you’ll make your fair share of pars, which can be celebrated like birdies when you’re trying to break 90. For more, read our post on Approach Strategy 101. Paradoxically, the closer to the green you get the more complicated the game can become. 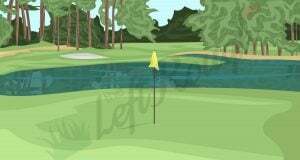 You are expected to play from a bewildering variety of lies, slopes and surfaces. You may be carrying three or even four wedges in accordance with the modern trend. There’s an almost infinite range of shots you could choose to attempt. Pressure, too, increases around the green. Hit a poor drive and you may have time to recover. But chunk or top a chip or pitch and a shot is irrevocably gone. The chip should be the first choice when there is no obstacle between you and the flag, the aim being simply to bump the ball on to the putting surface and get it rolling as quickly as possible. You don’t have to use a wedge. If you have plenty of green to work with and don’t want the ball to stop too quickly, a 7 or even a 5 iron can work well particularly if you grip down the shaft for extra feel. But if you do need to pitch over sand, water or sloping ground, use as much loft as you need and don’t hesitate to aim away from the flag for greater safety. 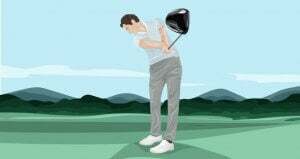 Other things being equal, the chip and run is the safer shot of the two and reduces the risk of chunking or topping, which are usually the result of over-anxiety to get the ball airborne quickly. That said, the safest option of all may be to putt from off the green if the ground conditions permit, which they do more often than you might think. So use this simple rule of thumb: if you can’t putt, chip. If you can’t chip, pitch. Playing for safety from tee to green is a very positive stroke-saving strategy, but to break 90 you also need to get down in a maximum of two putts more often than not. Great putters have to combine excellent technique and temperament with an almost uncanny ability to read the breaks and borrows of a green. But fortunately a consistent standard of about 36 putts per round is much easier to achieve. The key to success is to focus on the speed of the putt rather than trying to decide upon an exact line. Just think how often you’ve watched on TV as a top pro and his caddy, both with many years’ experience on a huge variety of greens, spend an eternity trying to agree on the correct line even for a relatively short or medium length putt. If it’s that tough for them, it must be almost impossible for lesser mortals, and even for the pros the decision is always something of a lottery anyway, since the most truly struck ball can easily be thrown off line by the imperfections and cleat marks which abound on greens. Trying to manipulate the putter to start the ball on a precise line is also a sure way of generating the muscular tension in the hands and wrists which is so often the cause of really disastrous putts – those which embarrassingly stop half way to the hole or go charging several feet or more past it. 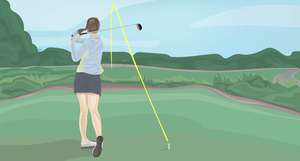 Of course you need to take account of any obvious slopes and bumps, but once you are free of this unnecessary tension it should be a relatively simple matter to stroke the ball on a broadly correct line and at the appropriate speed. Get the ball to “die” close to the hole with reasonable consistency in this way and you should be forever free of the three and even four putt nightmares which destroy all hopes of breaking 90. One of the keys to building the confidence which is vital to good golf is to know your limitations and play within them. So although the strategies outlined above might seem defensive, they are crucial in developing the positive scoring mindset which will see you through the 90 barrier and beyond. Become a good judge of speed on the greens, and you’ll find a decent proportion of longer putts drop in. You can then refine your judgement of line as you gain experience. But if you once get it set in your mind that you are a poor putter, forever doomed to taking three or four to get down, it will be very difficult to progress. Likewise, if you develop confidence by hitting wedges or short irons consistently to the heart of the green you can progress simply and naturally to approaching the green from longer distances. 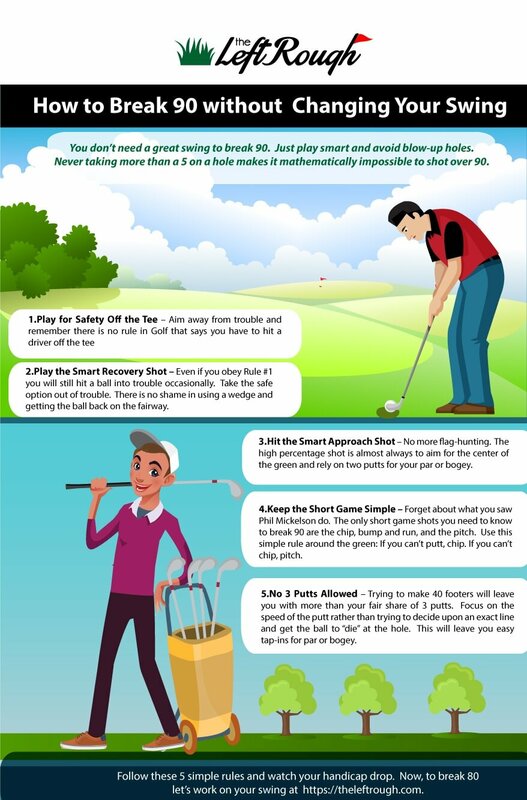 But persist in topping or chunking the longer irons or fairway woods which you do not yet have the ability to play, and you may significantly impair both your enjoyment and your speed of improvement. Have the discipline to stick to a sound game management plan and you can be shooting in the 80s sooner than you thought possible.